I’m not a singer-songwriter, but listening to Victoria Love’s new EP makes me wish I were. 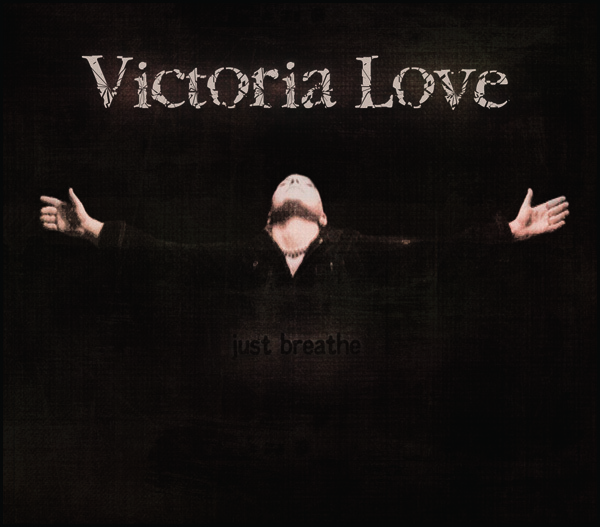 The cover of "Just Breathe" features Victoria Love herself. Imagine taking Arabic rhythms and then twisting them slightly to the side. Now fill the space with gothic-friendly vocals and a host of stringed instruments. Give lyrics with familiar and relatable themes: redemptive love, righteous indignation, artistic passion. What you’ll find when the dust settles is Just Breathe, a haunting five-track disc that will make you want more even if this isn’t the sort of music you normally listen to. Ever since I got this disc, I’ve been listening to it over and over. It’s been on rotation in my car so often that I think my kids are starting to learn the words. But I’ve also seen Victoria Love live in concert, many times over the years — the monthly Elle Acoustique show at the House of Blues in Houston is her brain-child — and one thing that I really like about Just Breathe is that the record complements the energy of the live performance, rather than the disc and the live show trying to be copies of each other. This is refreshing. One of the tracks, “Yours for the Taking,” begins stealthily. I knew this song from her live shows for a while before I heard it recorded, and it was a new experience when I popped the disc in. I thought of Trent Reznor, but not in his usual aspect; now he was being seduced by an industrial/tribal bellydancer. A temporary situation, because she’d be abandoning him before the end of the song, and even though he’d be affected by it for a long while afterward, he wouldn’t have any regrets. Maybe I’m letting my imagination run away with me? I don’t know. The thing about this music is that the sound is so full, it’s easy to recede into it, to let the layers of instrumentation — including exquisitely supportive violin, cello, bass — pile on top of you while your subconscious plays around with the vocals. It’s a singularly fun experience to lose yourself in it for a while. Love has, frankly, a beautiful voice. And her lyrics have depth, subtlety — just enough to make even a reserved person want to sing along out loud — but there’s nothing obscure about what she’s singing. The effects on the plugged-in tracks are tasteful, not at all overpowering. They add to the mood rather than conspicuously announce their presence, a balance which can be difficult for some artists to achieve. I rather enjoy that the last verse of “Needs” is actually “sung” by an electric guitar, as if the instrument were taking over for the singer. (When you hear the song, you’ll understand. In fact, you’ll probably understand a lot.) The acoustic bonus tracks are a real delight. If you keep up with my Facebook page, you’ll note that I posted some of her songs there. I can’t wait for the full-length album. It was still dark outside. It was so dark, in fact, that the sun wouldn’t be rising for a couple more hours. Groggily I registered this fact, and then reflected on the relative merits of pushing the kids’ bedtime back a little bit so they wouldn’t wake up so early. I rubbed my eyes and tried to focus them, thought I bet I’m going to need glasses soon, and then finally saw that he was in fact dressed for school. Even his little leather belt was around his waist. It was over his untucked shirt instead of through his belt loops, but we’ll take that. By now Daddy was awake, too, and lauding our little man on his morning’s accomplishments. Our son is four years old, and these little milestones are a big and welcome deal, one that, in the not-too-distant past, we felt like we wouldn’t ever see. I rolled out of bed and paddled down to the kitchen to get the fruit snacks, rewarded him, and then decided it was in fact late enough for me to be up and in the shower. The morning routine commenced, and I was grateful it didn’t start with whiny, sleep-deprived children resisting the sullen call of the Wake-Up-For-School Fairy (also known as a cranky parent who really could have had another three or four hours of sleep, too, thanks very much). They say that, when training one’s very young children, three days of a consistent pattern establishes a routine. So sleep training and potty training and brush-your-teeth training and stories and songs at bedtime, as well as a host of other things, need only three days or nights in a row to become habit. This is delightful rhetoric, an optimistic forecast that many parents will probably laugh at in hindsight. As much as I enjoy a certain degree of spontaneity in my life, I have to admit I am a creature of habit, one who appreciates routine and order, even if I’m not great at maintaining them myself. Routine and order are predictable, stable, familiar. They are a safeguard against anxiety. They make enormous tasks conquerable. They give us something to hold onto when our lives go spiraling out of control. Hallowe’en is one of my favorite holidays — second, in fact, only to Christmas. I consider it the official kick-off to the holiday season, the very best time of year. In the autumn, the weather is better, everything feels festive, the semester is winding down to its glorious end, and people in general are more generous and kind and happy. Yes, of course I’m generalizing. I’m sweeping broad strokes across my palette of existence. This leaves me able to appreciate the specific details of every holiday season in a fresh way, since those details tend to shift around in surprising little moments. Most of the time they are happy or pleasant at least. And yes, “real life” still intrudes sometimes. But if I pan out from the scene and look from a wide angle, I will see that life is very good, and I will count my blessings and be grateful. I don’t want to forget to do that, though it can be easy to do so in the crazy-hectic routine of every day. When I was in eighth grade, my social circle consisted of very few people. There were a couple of other kids in my class at school whom I was sometimes friends with, but mostly I was dramatically unpopular. I had been at that awful school since kindergarten, and although I’d had friends in the elementary grades, over the years they’d moved away, been held back a year, decided I was just too weird for them — whatever. By eighth grade, all I could think about was graduating and moving on to high school. Sure, most of the kids I had gone to junior high with would be there with me — the girls at least: this was Catholic school, after all — but all the other Catholic grade schools in Houston and some of the public ones, too, would be feeding in as well, and so the potential for friendship would yawn wide like the Grand Canyon. I did have two very good friends, however, though neither was my age and neither attended my school. They were two of my first cousins, Meredith and Chuck. Chuck was in sixth grade, Meredith in fourth, and because our large extended family tended to get together a lot on the weekends, I could reliably depend on something like a social life, and so the trauma of having to go to school every day where I was, for all intents and purposes, treated like a bug, was lessened a little bit. On Hallowe’en, that year I was in eighth grade, my twelve-year-old cousin Chuck died. It was unexpected. He’d been in the hospital three days. He’d been diagnosed earlier that week with what my mother referred to as “acute adult leukemia,” and then in the hospital he’d contracted strep throat. That afternoon — it was a Saturday — they’d turned off his life support, and the shell of a precious boy who had once been my cousin was no more. I would spend the next six weeks crying myself to sleep, unable to articulate to anyone what I was going through, but the days following the death were undoubtedly horrendous for everyone. I remember the tortured face of my Great-Aunt Mary, leading the San Antonio contingent, climbing the steps to my cousins’ front porch with arms flung open to embrace my grieving uncle. I remember Sister Jane, the principal of the high school I would be attending next year, coming over because Chuck’s older sister was already in ninth grade there, and Sister Jane knew it was her duty to come. The monsignor at my school, Father James Dinkins, did not come to my house, or to my cousin’s house. At the All Saints’ Day Mass Monday morning, his homily in front of the entire school was about an experience he’d had as an adolescent, when his twelve-year-old cousin had died of leukemia. I remember nothing else about his sermon except that it seemed strange he would have had any experience like mine, and I assumed he was making it all up, straight out of The Catcher in the Rye, directing his homily at me without making eye contact, without offering me or my family a word of direct support, even though we’d been in the parish for years longer than he had. He appreciated my family’s tithes, that much I knew, but that was where the social contract ended. That afternoon, he paid a visit to my eighth grade class, and after a few words of pleasant greeting with everyone in general and a little discussion about what everyone had done for Hallowe’en, he walked right up to my desk and said jovially, “I understand you had a very interesting weekend,” as if I’d gone white-water rafting or deer hunting for the first time. “Do you want to tell us about it?” he asked. I glanced at my teacher. She looked taut, ready to spring into action, assuming her help would be needed or welcome, or permitted. The priest was between her and me. I shifted in my desk. “My cousin died,” I said. “What was that?” he asked, leaning his ear over. I could detect whispers in the room around me. I didn’t know how to mourn something so profound as the death of one of my best friends. I quit playing the piano and even stopped, for a while, writing stories. I began wearing black on the weekends. I tried to find as many pictures of my cousin as possible to make a collage for my room until my mother scolded me not to build a shrine. Everyone was sad, my grandmother explained, enfolding me in a hug and telling me I needed to stop crying. “Are you nighttime?” Their punchline, hilarious to them, stung me just the way it was supposed to, and I swallowed my grief down, understanding that it was not a safe thing to show. Eventually, what saved me from a crippling sadness was stoic routine. I had things to do. Tests to study for. A school newspaper column to write. Essay contests and spelling bees to win. That grade school to put behind me as I embarked on a hopeful time, high school. Eventually, life continued on at its genial pace, and all the grief I and my entire family was feeling got tucked away into the corners of our traditions, one more new wrinkle to incorporate. I got back to celebrating Hallowe’en slowly at first. Even though I still dressed up and participated in parties and trick-or-treating, it was a long time before I could look at my candy bucket and not remember the handfuls of Jolly Ranchers and tiny Reese’s Peanut Butter Cups that had been dropped into my cousin’s casket with him by his classmates. I spent about a decade letting my grief for him be the go-to sadness I defaulted to when I was feeling depressed, the thing I most remembered when someone else died, the gravitas that I, as a young adolescent, could not shake and which fed my Otherness. I’ve never been much of a drinker. The only time I’ve ever drunk alone was on what would have been Chuck’s twenty-first birthday. I had just broken up with a boyfriend whom I should have kicked to the curb six months before. He wasn’t dealing well with the break-up and wanted really badly to be friends. I went to a pub and ordered myself dinner and an imposing pint of Ace Pear in honor of my cousin. The boy I’d just dumped showed up at the tail end of it, invading my solitude, and I let him listen to stories about my cousin. He looked eager and supportive and hopeful. I told him good-bye and left him at the table without even a glance over my shoulder. Later, at home, I launched myself into my routine, locking my grief back into the recesses of my heart for what I hoped would be the last painful time. It’s been nearly twenty-five years since my cousin died, and here I am writing about it — which I hadn’t really intended to do when I sat down to write today. Hallowe’en is a big holiday at my house now. And in my immediate family. Again. My parents picked the holiday back up once I had children of my own. Traditions, you know. Comfortable, familiar habits. Costumes, candy, knocking on strangers’ doors in search of treats that will bring the little ones joy. We put out decorations every year: witches, spiders, pumpkins with knowing grins. And always ghosts, the representation of our collective fears and hopes about the afterlife. We traipse around on what the old religions tell us is the night when the veil between the worlds — those of the living and the dead — is the thinnest. We light candles. We don’t tell the kids they can’t eat candy before bedtime and with breakfast the next morning. We watch Tim Burton movies. We dress ourselves in costumes, costumes, costumes. My girlfriends are I wear pointy hats to tea. And then we put it all away until next year. We focus on Thanksgiving. The guest list, the order at the butcher’s market. The sculpted turkey with a double-fan scrollwork tail I put on the mantel for decoration. The ceramic pumpkin tureen and little pumpkin bowls which will hold my famous creamy pumpkin soup in just a few short weeks. And the discussions with my husband over what we’re going to get the kids for Christmas this year. The ghosts recede, and this too is their habit.